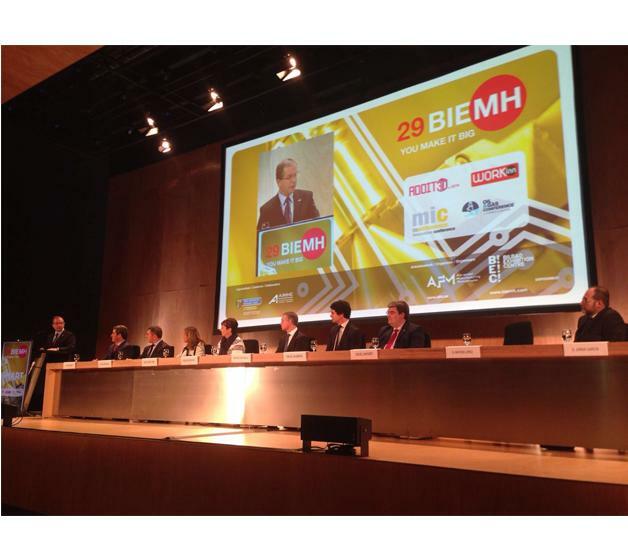 Íñigo Urkullu, Lehendakari of the Basque Government, has opened the 29th Spanish Machine Tool Biennial this morning in Bilbao. From today and until 4 June, Bilbao will play host to 1533 firms from 27 countries at the Bilbao Exhibition Centre facilities. The Lehendakari of the Basque Government, Iñigo Urkullo, has presided over the official opening ceremony of the 29th Machine Tool Biennial and of ADDIT3D this morning. Considered as the most important industrial fair held in Spain and the third most important in Europe, the show will gather together 1533 exhibiting firms from 27 countries in Bilbao. During the opening ceremony, the Lehendakari was accompanied by the Regional Minister for Economic Development and Competitiveness, and President of BEC, Arantza Tapia, the Head of the Provincial Council of Vizcaya, Unai Rementería, the President of AFM, Advanced Manufacturing Technologies, Antxon López Usoz, the President of AIMHE, Jorge García Kaibide, the mayor of Bilbao, the mayor of Barakaldo, the director general of BEC, Xabier Basañez and the President of the Chamber of Commerce of Vizcaya, José Ángel Corres. Following the opening speeches, the group made an inaugural visit, and were able to see for themselves the new products presented at some of the most outstanding stands in pavilions 1, 2, 3, 4B, 5 and 6 that occupy the fair. ADDIT3D has also been opened during today’s ceremony. This is the first international additive manufacturing and 3D fair to be held and it takes up considerable space in pavilion 3, with 84 companies. During his intervention, Antxon Lopez Usoz, President of AFM stated: “A strong, dynamic and competitive industry generates a healthy and sustainable economic activity, developing and attracting the best professionals, generating knowledge and high innovation capacities, promoting companies’ international presence, and driving all kinds of high added value services”. After the opening ceremony, the Lehendakari visited several companies of the sector, expressing interest in their projects and new products. The AFM association has incorporated into its management, ADDIMAT, created in 2014 and whose aim is to group together and provide a service for additive manufacturing companies, and more recently ESKUIN, the hardware and industrial supply cluster, and AFMEC, the Spanish Association of machining and metal-mechanical transformation. On 31st of May, at 12.00 h. the inauguration of WORKinn will take place. It will be presided over by Teresa Laespada, Minister for Employment, Social Inclusion and Equality of the Regional Council of Vizcaya, in the BEC atrium. On 31st of May at 10.30 h, the opening event of the conferences on additive manufacturing, which will be held on 31st May, 1st and 2nd June, will take place in the conference hall of pavilion 3. The Innovation awards presentation will take place on 1 June at 11 am in the BEC press room. It will be presided over by Imanol Pradales, Minister of Economic Development of the Regional Council of Vizcaya.